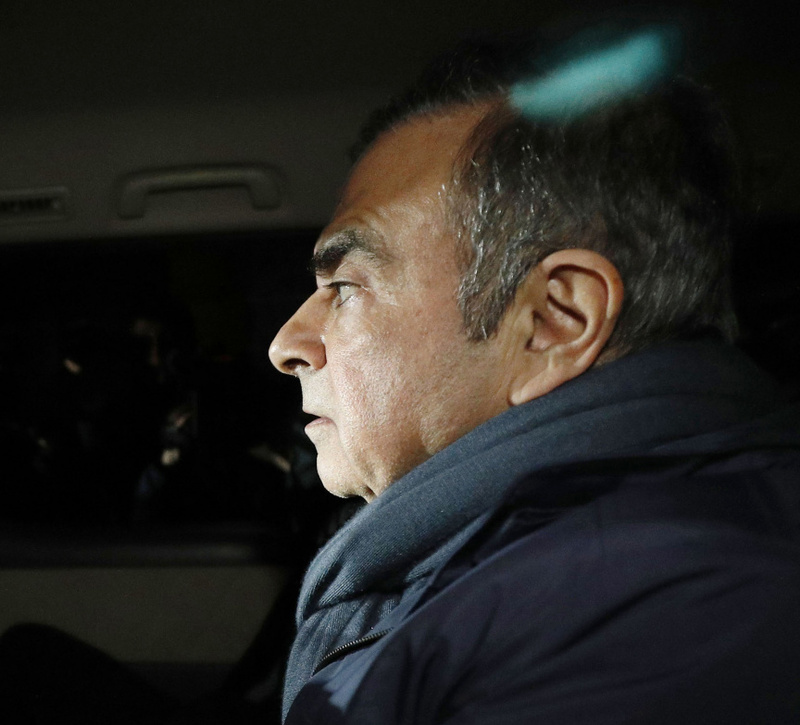 TOKYO (AP) — Nissan's former Chairman Carlos Ghosn was arrested Thursday morning for a fourth time by Tokyo prosecutors investigating him for alleged financial misconduct while leading the Japanese automaker. Tokyo prosecutors said Ghosn's arrest was on suspicion he diverted $5 million from funds that were being relayed from a Nissan subsidiary to an overseas dealership. Their statement said the money is suspected of going to a company Ghosn virtually ran. Ghosn's whereabouts following his detention were unclear. TV footage showed officials entering Ghosn's apartment in Tokyo, and a car later going to the prosecutors' office, barely a month after Ghosn was released on bail from the earlier arrests. A car with the same license plate was later seen entering the Tokyo Detention Center, where Ghosn spent more than three months following his arrest on Nov. 19. "My arrest this morning is outrageous and arbitrary," Ghosn said in the statement. "It is part of another attempt by some individuals at Nissan to silence me by misleading the prosecutors. Why arrest me except to try to break me? I will not be broken. I am innocent of the groundless charges and accusations against me." The prosecutors' statement did not mention Oman, but the allegation appears related to the investigation by Nissan Motor Co.'s French alliance partner Renault about payments in Oman to a major dealership, some of which is suspected of having been channeled for Ghosn's personal use. "This is an example of hostage justice," Hironaka told reporters. "This is meant to hurt Mr. Ghosn and give more advantage to the prosecutors' side." Ghosn's family expressed worries about another detention, calling it in a statement, "solitary confinement as part of an attempt to force a confession." Ghosn had tweeted he would hold a news conference April 11, where he would tell "the truth" on what was unfolding. A condition for his release on bail included not using the internet, but it is unclear if the authorities are considering the tweet a technical violation. "I am confident that if tried fairly, I will be vindicated," he said in the statement Thursday. "I am determined that the truth will come out. I am confident that if tried fairly, I will be vindicated." The maker of the March subcompact, Leaf electric car and Infiniti luxury models is holding a shareholders' meeting next week to oust Ghosn from its board. "Nissan's internal investigation has uncovered substantial evidence of blatantly unethical conduct," said company spokesman Nicholas Maxfield.